The Rolex GMT-Master II is one of the most famous and popular luxury watches with GMT functionality. 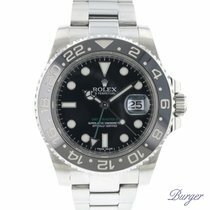 Models such as the "Batman" with a blue and black bezel are highly coveted and desired investments. You can save money on the gold models. The GMT-Master II from Rolex is one of the most well-known watches that can display multiple time zones. The Swiss manufacturer continues the story of the GMT-Master with this automatic watch. For almost 20 years, both models were available, but Rolex stopped producing the GMT-Master at the turn of the millennium. Today, it's considered one of Rolex's most highly sought-after collector's watches, together with the Submariner and the Daytona. GMT-Masters can be identified by their bidirectional, rotating 24-hour bezel with an additional hand, which completes one rotation every 24 hours. This triangular-tipped hand displays a second time zone with the help of the 24-hour scale on the bezel. Models with a bicolor bezel signify whether it's daytime or nighttime in the second time zone. The lighter half (red or blue) symbolizes day and the darker half (blue or black), night. This automatic watch is now available in many different versions. The ceramic bezel comes in black, black/blue, or red/blue. 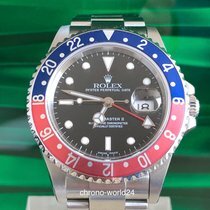 The red/blue bezel is reminiscent of the Pepsi colors, earning it the nickname the "Pepsi" watch. This color combination was available in 1955 as well, when the first GMT-Master was presented. 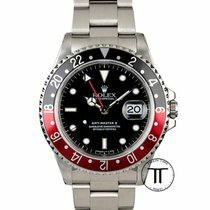 The "Rolex Coke" watch is just as well known as the "Pepsi watch" and is named for its black/red bezel. 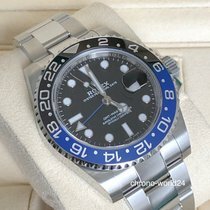 How much is a Rolex GMT-Master II? 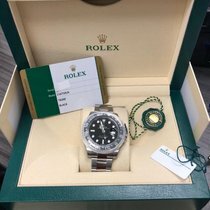 You can purchase a current, stainless steel Rolex GMT-Master II in mint condition with a black ceramic bezel and the reference number 116710LN for around 9,200 USD. Pre-owned models go for 8,300 USD. Pre-owned watches with the reference number 16710 , which were produced from the late-1980s until 2007, sit in a similar price range. Set aside around 9,000 USD for one of these GMT-Master II's. 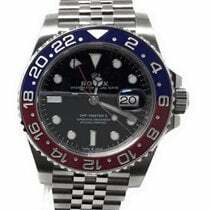 The Rolex GMT-Master II with the reference number 16760 is of particular interest to fans of vintage watches. This model is known as the "Fat Lady" because its caliber, the 3085, made it a bit thicker than the "normal" GMT-Master. The "Fat Lady" was the first GMT-Master II and was only in production from 1983 to 1988. This is why there are significantly fewer examples of this model than there are of the ref. 16710. A pre-owned "Fat Lady" costs about 9,800 USD. If you enjoy the classic design of the Rolex Pepsi, but aren't looking to buy a vintage watch, you should take a closer look at the ref. 11610BLNR. Like its historic predecessor, this model has a red and blue bezel. However, its bezel inlay is made of scratch-resistant ceramic instead of the original aluminum. With its white gold case and bracelet, prices for this GMT-Master II come in at around 32,400 USD. The yellow gold version with the reference number 116715LN and a black ceramic bezel is a bit less expensive at about 27,900 USD. Prices for both models on Chrono24 are significantly lower than the official list prices. The stainless steel Pepsi made its return in 2018. This GMT watch with the reference number 126710BLRO has a five-piece Jubilee bracelet and is powered by the in-house caliber 3285. This movement boasts an especially efficient Chronergy escapement and a 70-hour power reserve. The list price for this model is 9,200 USD. The so-called "Rolex Batman" is especially highly coveted. This GMT-Master II is made of stainless steel and has a blue and black bezel. Due to high demand, wait times of several months are commonplace when buying from offline retailers. Purchasing online requires less waiting time, though also results in slightly higher prices. 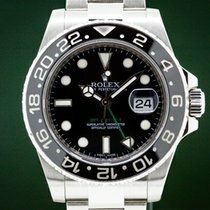 A never-worn Rolex Batman ref. 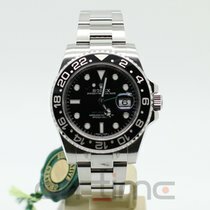 11610BLNR costs around 10,900 USD, while a pre-owned model costs about 10,200 USD. Early versions of the GMT-Master were available in bicolor or solid gold. It's no different with the GMT-Master II: The band is available in stainless steel, yellow gold, white gold, and a combination of stainless steel and yellow gold. Rolex calls their bicolor models " Rolesor," and they're a characteristic mark of the brand. The manufacturer has used this combination of materials since the early 1930s. At Baselworld 2018, the company presented an Everose gold and stainless steel edition as well as one in solid 18-karat Everose gold. Both models feature a black and brown Cerachrom bezel and are powered by the caliber 3285 with a 70-hour power reserve. Yellow gold models are also available with either a black or green dial and a black bezel. The white gold version has a red and blue bezel. Beginning in 2018, this version features a blue dial. It was previously black. The designs of Rolex watches have remained largely unchanged over the last 60 years. This rigor and dedication to form and tradition is one of the secrets to their success. Any changes are minimal and only to small details. This is also the case with the GMT-Master II, which received a high-tech ceramic bezel in 2007. The ceramic bezel replaced the earlier aluminum bezels. Ceramic has many advantages: It's especially hard, scratch resistant, and yet still very lightweight. Dials and markings are cut into the material and receive a patented platinum or gold dust coating. At the beginning of production, the ceramic bezel was only available in black, as bicolor variants weren't yet technologically feasible. This changed in 2013 when Rolex introduced their black/blue model. Rolex used an independently developed process for production. Before the bezel is heated in the oven, engineers apply a chemical compound solution to half the bezel. This causes that half to turn blue during the firing process. One year later, Rolex successfully produced the red/blue ceramic bezel for the first time. Since this high-tech material is UV-resistant, there's no need to be concerned about the color fading over time. The automatic caliber 3186 ticks away inside the current GMT-Master II. Its rotor winds the spring bidirectionally. The movement is located – similar to all other Rolex sports models – behind a screw-down case back. It vibrates at 28,800 alternations per hour and was constructed with all the best Rolex know-how. The movement features red anodized minute wheels, a balance bridge, and a free-sprung blue Parachrom hairspring. Thanks to the Breguet overcoil (created by raising the hairspring's last coil and bending it in towards the center), the hairspring can breathe better, resulting in improved precision. Additionally, it is made from a paramagnetic alloy, making it impervious to magnetic fields. Working together with the balance rim, this creates an auto-compensating system, meaning the frequency stays consistent even during temperature fluctuations. High-precision regulation occurs via Microstella nuts on the balance rim. Using a special tool, you can regulate the watch without disassembling it. The designers decided against the usual method of regulating the watch via a regulator. Like every Rolex movement, the caliber 3186 received a certificate from the Official Swiss Chronometer Testing Institute (COSC). Rolex introduced the first generation of the GMT-Master in 1955. Originally, the timepiece with reference number 6542 was developed for Pan American World Airways (Pan Am) pilots. At the beginning of the 1950s, the airline was in the market for watches that could clearly display two time zones. Rolex won the contract, and the GMT-Master became the official watch of the airline. Pan Am ordered two versions of the watch: one with a black dial for pilots and one with a white dial for ground staff. Versions with reference number 6542 are highly sought after by collectors and watch enthusiasts and sell in the five-figure range. The GMT-Master began enjoying increased popularity within a few years, extending well beyond pilots. Actor Daniel Craig, who wore an Omega Seamaster as James Bond, wears a Rolex GMT-Master in his everyday life. Actor Tom Selleck, best known for his role on Magnum, P.I., also relies on a GMT-Master. Cuba's former president, Fidel Castro, was also a Rolex fan. In addition to a Submariner and a Day-Date, he owned multiple GMT-Master models. The Geneva-based manufacturer introduced the GMT-Master II for the first time at the beginning of the 1980s. Due to its larger case, the watch with reference number 16760 was nicknamed the "Fat Lady." The watch was available with either a black or black/red aluminum bezel. The automatic caliber 3085 offered the possibility of setting the hour hand independent of the minute hand by pulling the crown out only halfway; in this setting, the wearer could also set the date. Moreover, the designers replaced Plexiglass with scratchproof sapphire glass. The "Fat Lady" was only produced until 1988, making it rare and beloved amongst collectors. The reference number 16710 succeeded the "Fat Lady." With the GMT-Master II, Rolex built upon the success of their first GMT time zone watch. Originally developed for Pan Am pilots, the GMT-Master developed into an icon in just a few short years. Actors, heads of state, and business leaders recognize and appreciate its functionality, reliability, and robustness. Its elegant yet sporty design, which has remained consistent over the years, has turned this watch into a classic collector's item. The use of materials such as yellow or white gold raises the value of certain models. Since Rolex watches maintain their value and rare versions tend to be worth more than their original prices, they're solid investments.